World’s leading camera and accessories player Canon shared their performance in the last fiscal and the plans for the upcoming year. In India they have at present 93 own retail stores called Canon Image Square and have plans to increase the count to around 200 stores this year for which they have to open another 100 odd stores in this fiscal. Canon reported a 21 per cent growth this year and aims to generate revenue of INR 2350 crore in 2013. For retail, Canon plans a fresh strategy which will enhance the customer experience. They will soon have a direct sales team, Canon direct service, Canon specialized Media and Professional consultants in the store. Canon also announced their foray into new domain of In-studio printing. 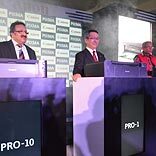 They launched three A3+ ulta professional photo printers: PIXMA PRO series of inkjet printers and with this they aim to achieve 25 per cent market share which as of now is 19 per cent. Overall Inkjet printer industry is worth INR 1,000 Crore and Canon shares INR 120 Crore of that.